I hope to make this a place where u can download your favorite books and install it on your PC or Smart phone/PDAs.I am starting with one of my favorite authors of all time..John Grisham . below are a seletcion of some of is best sellers which includes-Painted House,Time to kill,The Firm,King of tort,Last Juror,Pelican Brief, and The summons. 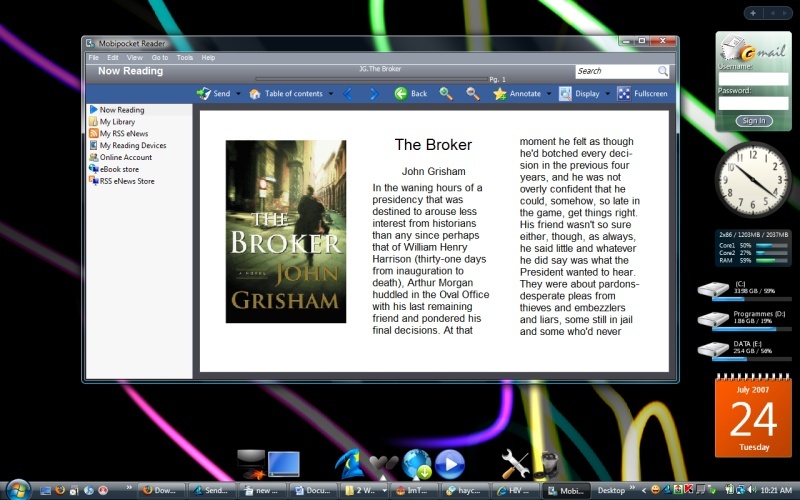 *To read the ebooks on your PC you need to download and installed the PC version of Mobireader. when u do install it.then u can just click on the the ebook and read them.if u want the ebooks to appear on the Mobireader’s library then you need to move then to the ebooks folder under My Documents. For SmartPhones and PDAs. -install the Mobireader appropriate for your phone then transfer the ebooks to your mobile Preferably to the Memory card.Put them into the folder named eBooks.if one is not created -Create it your self,then lunch the mobireader you will see all the ebooks in the Mobireaders Library. Hey Buddy!, I found this information for you: "Download Your Favourite eBooks". Here is the website link: http://bigbrovar.aoizora.org/2007/07/23/download-your-favourite-ebooks/. Thank you.